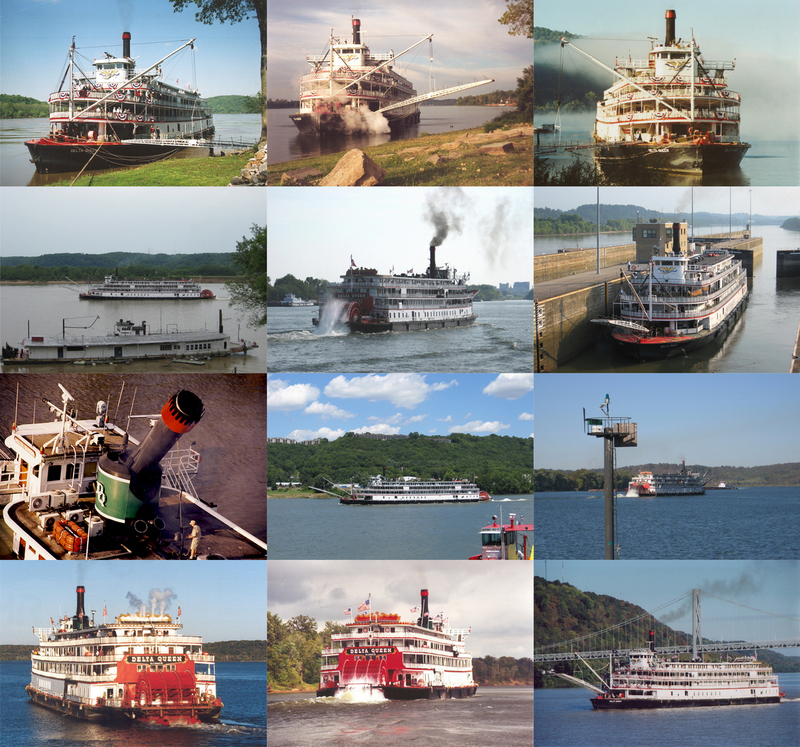 2014 steamboat calendars still available: Delta Queen calendar; HSPSI calendar. Chief Art Reese, Alice Tooker, Ruben Pilot, Waiter, Guy Tooker, Henry Mitchell, Waiter, Vic Tooker, Lewis "Red Rooster" Bayless, Deck, Robert Davis, Head Waiter, Big John, Bar Back, Mariam Edgar, Gabe Chengary, Purser, Bobby Rose, Deck, Capt. Don Sanders. Mate, Ernest Johnson, Watchman, Capt. 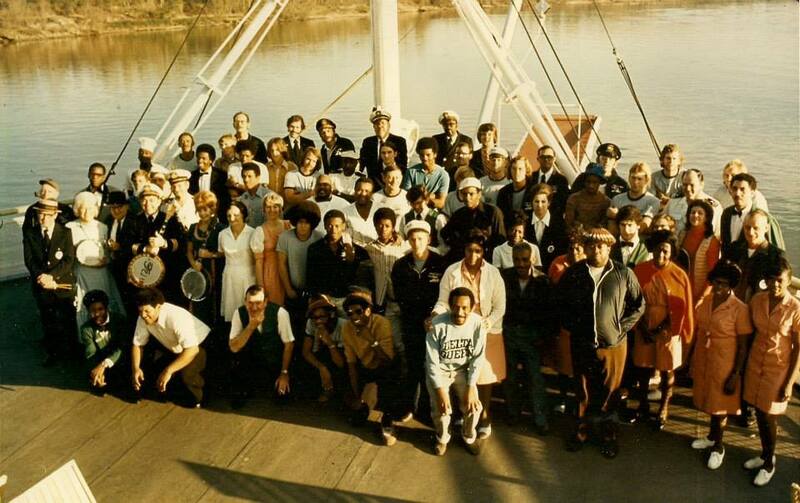 Ernest E. Wagner, Harvey Simmons, Bartender, Franklin Miles, Chief Steward, Tom Neff, Housekeeping Steward, Bubba Chinn, Fireman, Faye Rhomberg, Gift Shop, Jerry Brooms, Crew Steward, Estill Boyd, Asst. Purser, Ray Wannstrath, Deck, Tony Esplauge, Deck, Paul Rhomberg, Bar Steward, Cap'n Betty Blake, Mary Jackson, Maid, Allen Segrist and Tom Tallon, Oiler. 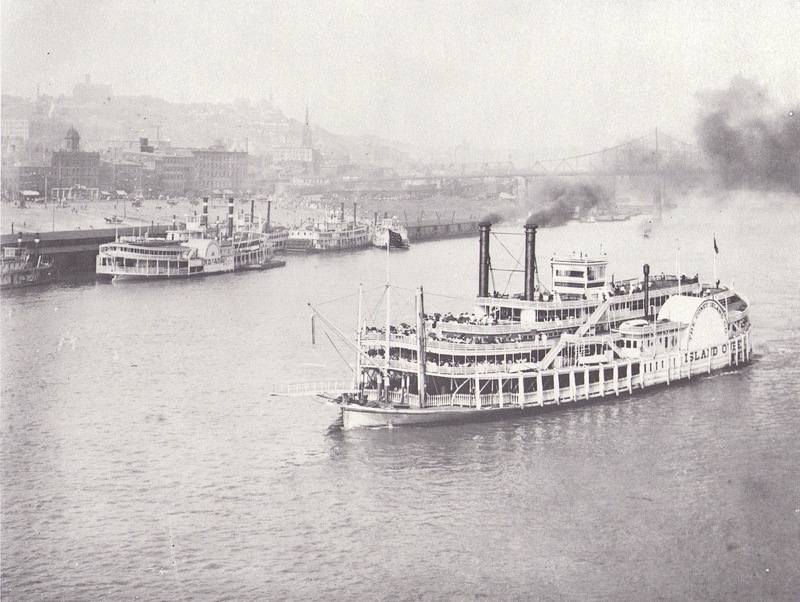 The American Queen Company completed its purchase of the Empress of the North, and changed her name to the American Empress. This move was completed today, but began in May 2013. The company started renovations last year, confident that the deal would eventually close. Meanwhile the steamboat community was looking on, taking bets. The christening ceremony will take place April 5 in Portland Oregon. From there, the American Empresswill embark on her maiden voyage, a nine day trip on the Columbia and Snake Rivers. She will navigate a course to Astoria, Oregon, Stevenson, Washington, The Dalles, Oregon, Sacajawea State Park, Washington, and Clarkston, Washington. To read the original article at travelagentcentral.com, click here. The bill would exempt the Delta Queen from requirements of Safety at Sea laws. It only makes sense, since vessels operating within the Boundary Line do not go out to sea. The bill passed the House of Representatives on September 25, but never got through the Senate. 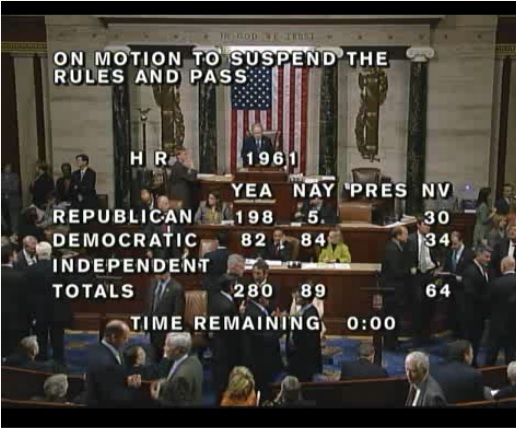 Because the bill failed to pass both houses, it died for the year. However, there is every chance the bills will be reintroduced in 2014. 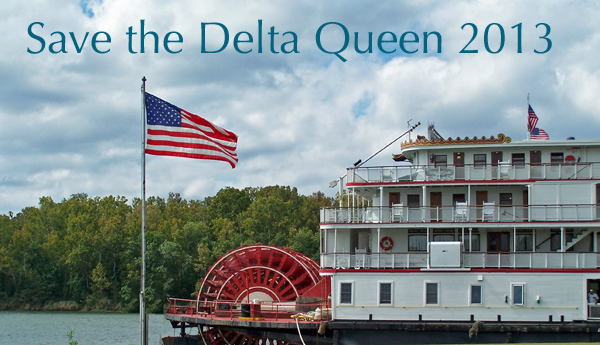 Remind them that the Delta Queen provides jobs and contributes to the economy in the river towns it visits, from Minnesota to Pennsylvania to Missouri and Louisiana. Getting the boat back into service will add a boost the American river cruise business. The National Trust for Historic Preservation, the American Maritime Officers, and the Seafarers International Union support the Delta Queen, and the Delta Queen is a national historic treasure. Following is from the S&D Reflector, December 2013 issue. Be sure to "like" the Julia Belle Swain on Facebook - click here! A Christmas day story in the Connecticut Mirror revealed that American Cruise Lines hired lobbyists to stop pro-Delta Queen legislation in the U.S. House of Representatives and Senate. According to lobbying disclosure forms filed in the House and Senate, American Cruise Lines hired Washington, DC-based Blank Rome Government Relations in August, making an initial payment of $40,000 to derail congressional approval of a bill that would re-impose an exemption to federal shipping law that expired in 2008. America Cruise Lines owns and operates the Queen of the Mississippi, which is competing for business with the American Queen, and would apparently see the Delta Queen as more unwelcome competition. Charles Robertson, chairman and CEO of American Cruise Lines, also owns Chesapeake Shipbuilding, where the Queen of the Mississippi was built. He is currently building four more competing paddlewheel cruise ships.To read the entire article, go here: Connecticut Mirror. Despite ACL's lobbying, pro-Delta Queen legislation passed the U.S. House of Representatives. In the Senate, it is in Jay Rockefeller's Committee on Commerce, Science, and Transportation. Therefore, we encourage the steamboat community to send letters of support to Senator Rockefeller and remind him that America is waiting for the Delta Queen to go back into service in the cruise business. The New York Times also published a story about the Delta Queen on December 17, but neglected to report the negative lobbying. To read the article, go here: A Historic Vessel, Stuck in Place, The New York Times. 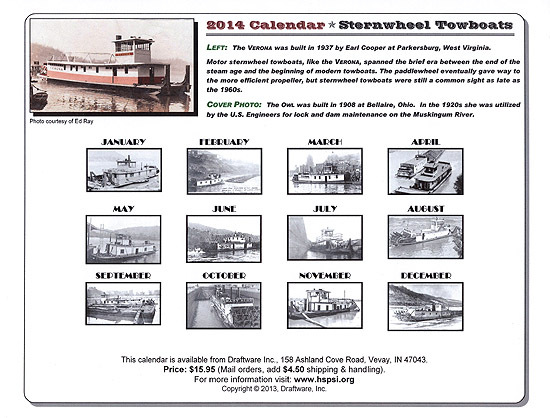 Holiday gift idea: a 2014 steamboat wall calendar! 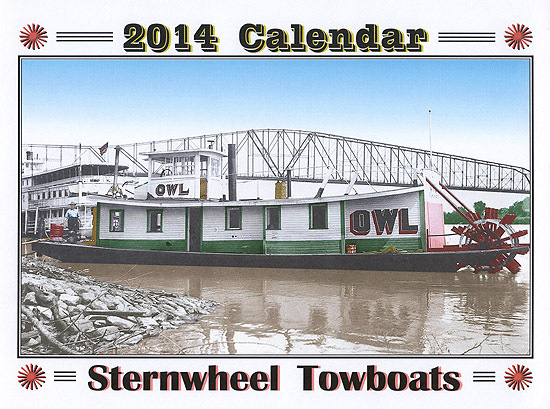 Click here to see the sternwheel towboat calendar by Steve Huffman. 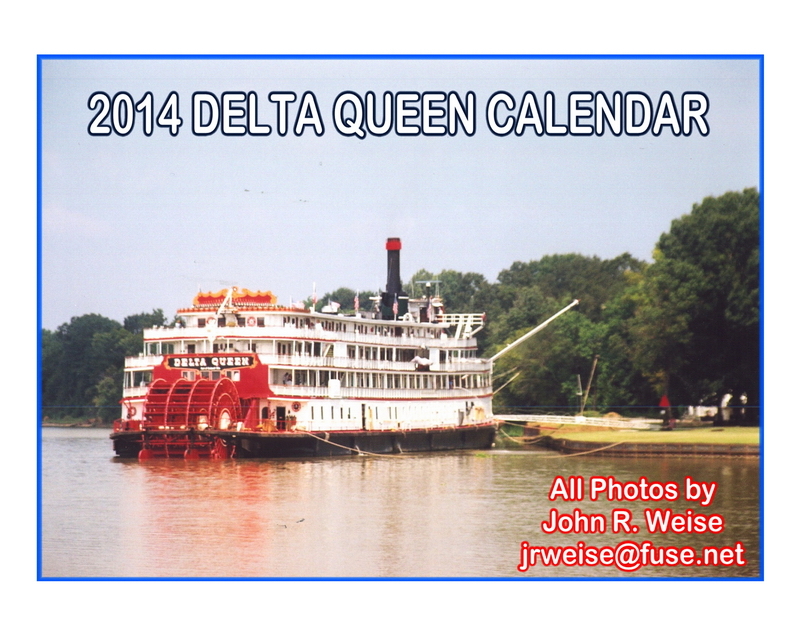 Click here to see the Delta Queen calendar by John Weise. I'm just starting a 1/8"scale of the Robert E Lee. I have the plans which atr a good start, but as good as they are, actual construction details are few. Do you know a source that, ideally, has original architect's details, or, detailed close up period photos showing structural details (column, beam, truss, window, floor framing)?Any help would be greatly appreciated. Editor's Note: If you can help Steve, email him directly - click here. The end of Congress is coming up along with the end of the year. The Senate needs to pass the Save the Delta Queen bill now. Otherwise, we need to start all over in 2014. Saving the Delta Queen is an issue to unite the country because everyone wants to see this boat get the exemption. Call both of your Senators and urge them to support S. 1022. Call now! Do it today! (202) 224-3121 (have your Senator's names ready when you call so the operator can connect you immediately). Be polite but firm: The Delta Queen is a vital part of American history we want to preserve for future generations. The Delta Queen must be allowed to work in the cruise industry. She is not ready to retire yet. It has come to my attention that during the Delta Queen debate in Congress in September, several U.S. Representatives (who shall go unnamed) made erroneous statements about the Delta Queen. They lied—or are just uninformed or brainwashed. They said the Delta Queen has no sprinklers, nor fire sensors, nor fire suppression in any passenger area. They further said there were "no means of aft evacuation." Those are complete lies. I grew up in the 1960s and 1970s watching my father add safety systems to the Delta Queen. When he was dying in 1987, I went through all his correspondence and newspaper clippings to help him prepare his papers for the Cincinnati Historical Society. I can assure you that my father spent most of his waking hours from 1966-1976 making sure that the Delta Queen is the safest boat on the river. He won exemption after exemption because Congress recognized the safety of the boat. 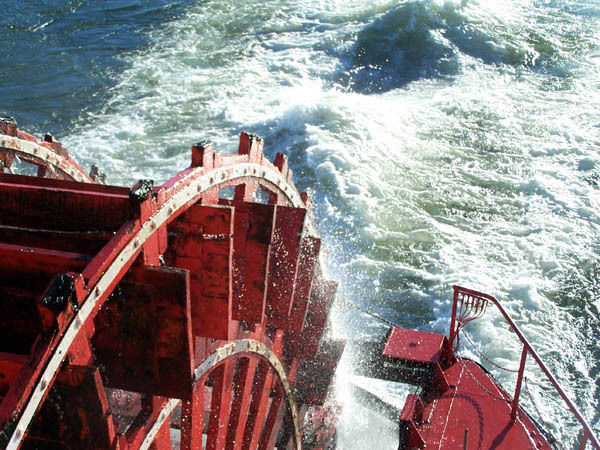 The Delta Queen has sprinklers, alarms, fire drills, even live-in firefighters! Further, the boat was built in the twentieth century, in Scotland, at the pinnacle of steamboat technology. The boat can run forever with proper maintenance and care. Current legislative status: The Delta Queen exemption, H.R. 1961, passed in the U.S. House of Representatives on Sept. 25, by an overwhelming majority. Now it needs a vote in the Senate as S. 1022, introduced May 22, 2013 by Senators Sherrod Brown (D-OH) and Rob Portman (R-OH). Senators Mary Landrieu (D-LA) and David Vitter (R-LA) joined them. When S. 1022 comes up for a vote, we will post a notice to call your two U.S. Senators. Meanwhile, trust and pray the boat will go back into the cruise industry. Extra credit: call your two Senators now to tell them that you care about the Delta Queen and look forward to the vote. I have come across an old Island Queen photo in my Dad's stash of steamboat resource materials. I did a quick Google photo search and did not find this photo on the web anywhere. Would you like to add it to your site? Editor's Note: Great photo. Thank you for sending it! holiday gift, or a great collectible? Our 2014 Wall Calendar is Here! 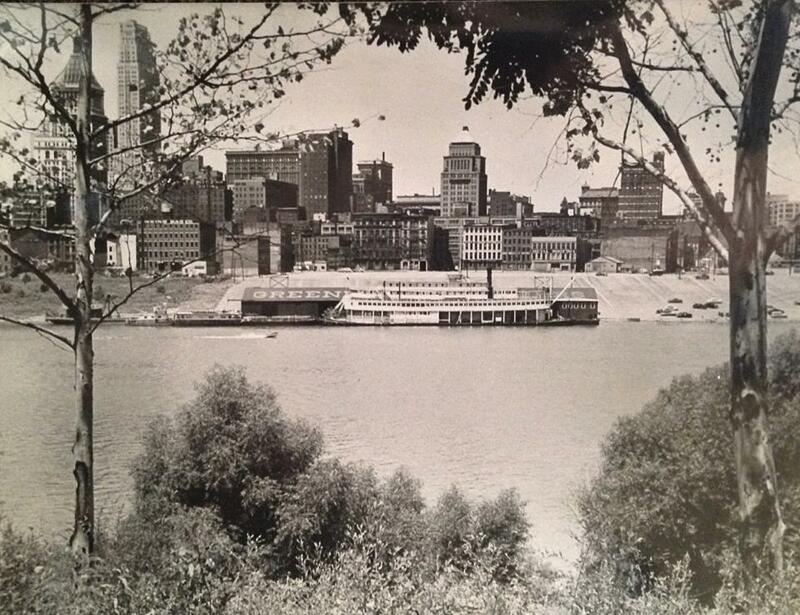 Back by popular demand, the 2014 calendar features early photos of sternwheel towboats. The calendar contains 13 large photos printed on heavy card stock, suitable for framing. Although we missed 2013, the 2014 calendar marks our 13th year of wall calendar offerings! Shipping: $4.50 for one (add $1 for each additional calendar). 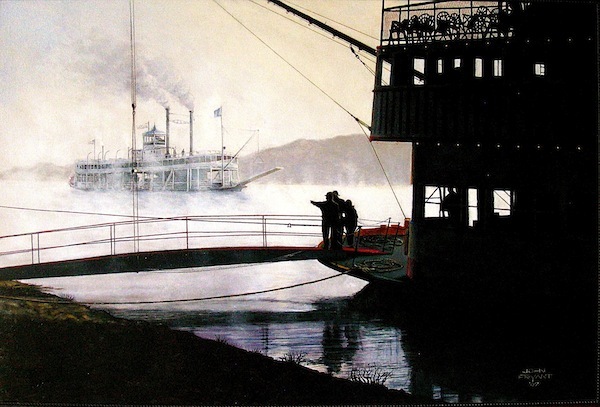 I call the painting "Time Traveller" as it shows the Belle of Louisville and the Idlewild together. I also call it my Twilight Zone painting, as this could never happen in real life. It is 24 x 36" less the frame and I painted it in honor of the Belle's upcoming 100th anniversary. The head of the present day Belle is on the right and one of the crew is pointing at the Idlewild steaming out of the past. It is a very hard painting to get a good photo of due to the contrast between the light and dark portions. This is the best I can do with the camera I have. I eventually want to sell it and would like to see it end up in the Louisville area. It has been shown at the Howard Museum and to some of the Belle's management, but no takers yet. In the meantime I thought Steamboats.com viewers might enjoy seeing it. Editor's note: Thank you for sharing this amazing painting, John! Contact John or see John's model boat exhibit at this site, click here. I am involved with a Facebook group called "You know you're from Cincinnati if . . ." Recently, someone posted a photo with the question of what was the vintage of the photo. I added my own comment to the many that were offered, but rather than tell you what I said, I thought I would send you a copy of the photo and invite you to respond. One man recognized it but called it General Greene. Most were focused on the cars and were guessing 50's or early 60s. I think some were thinking it was the Delta Queen in the photo although nobody suggested it specifically. Editor's Note: Craig's late father was a graphic artist who did a lot of work for the Delta Queen.Visit the Warren Stichtenoth art exhibit at this site, click here. Our thanks to the owner of this photo, Diane Hagler, who gave permission to post it at this site. The photo has been in her family for many years. 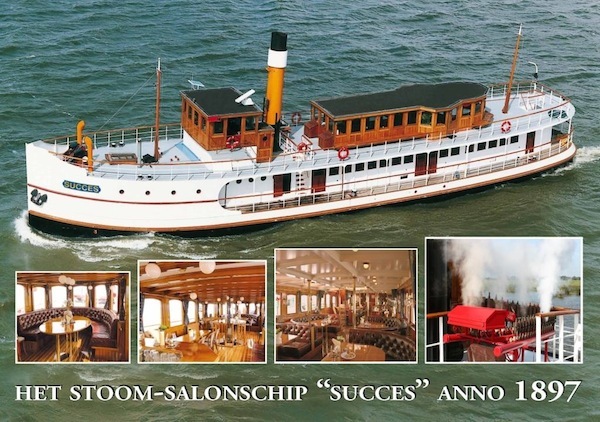 After the restoration and resurrection of the Steamship Success anno 1897, I kept it in service as a partyship for more than 16 years with great pleasure! However, in the absence of a successor for the preservation of this "sailing heritage" and because of my intention to move abroad, I decided to end this hobby and start the search for a buyer to give this unique object a new future. The "Succes" offers excellent opportunities as a passenger dayship (party ship/partyboat), but also as a (docked) restaurant or club facility, luxury yacht or houseboat. Because I don't want to have a big "for sale" sign on the bow, I want to try reaching potential buyers (or a good sales agent) through my personal network. You may be able to help me with your tips or by bringing this Successful sale to the attention of your friends and/or business associates (by i.e. mail or website). Of course, a successful tip will be rewarded. This link goes to a private page on our website where you will find the sales brochure (in Dutch and English). If you follow the link you will be asked to register yourself with a username and password after which you will have access to the sales information. To avoid misunderstandings: the "Success" remains sailing as long as I own the vessel! I hope you want to help me a step further and responds to this message/request.Many thanks in advance! http://www.partyschipsucces.nl (get a username-password to login and get information). Editor's note: We are more than happy to help. Let's get the word out in the steamship community about this amazing boat! This item is from Mary Charlton, posted on Facebook, and reposted here as breaking news! 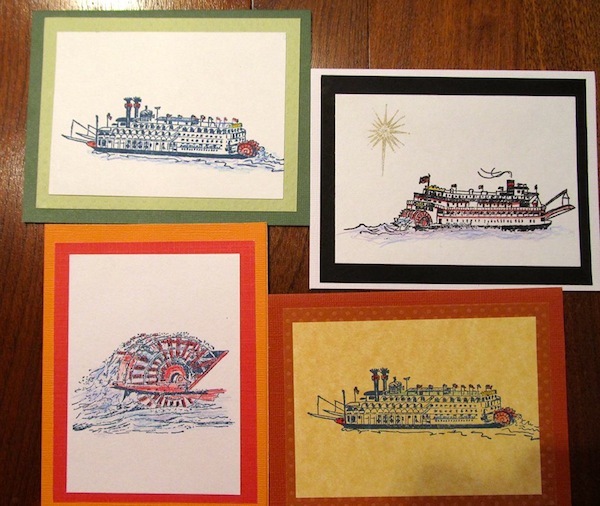 Steamboaters: interested in making cards, or doing other crafts, with rubber stamps of your favorite boats? We now have the original quality wooden stamps like I bought a few years ago on the Upper Miss! They will be available in two places: the AQ gift shop (as soon as I get them there, November 2) and Stamping Buddies Craft Room and Supplies. This includes the pithy sayings that went with the stamps about how steamboating is the best! I've been doing a card class on the AQ, and it has been very popular, producing very professional-looking cards in no time. Pam Koch owns the store, and can be reached at 513-891-2738. The store is at 4343 E. Galbraith Rd., Cincinnati, OH 45236, and the above name is also a Facebook page. Pam is very helpful with newbies (like me! ), and will be happy to show you easy ways to use your stamp, or let you in on the classes she has. Thanks to Claudette Waggoner, the wife of our CEO, John Waggoner, who has supported this project by getting the stamps for the boat, and my boss, Tony Nevitt, for allowing me to do the class on the boat! Hi! My g-grandma was Martha Minerva Kennett and her father William Lewis Kennett (1879-1930) worked on boats as did his ancestors. He ran a tug boat on Lake Erie, living in Cleveland in the beginning of the 1900s, and prior worked on steamboats in Allegheny Co. PA/Pittsburgh area and prior, in Gallipolis, Ohio. His wife Alma Dressler, who with her sister Helen, worked in vaudeville and perhaps worked on the show boats like the New Era Floating Palace, I am looking for crew lists and am new to this type of research. Martha told my other g-grandma that her father was a ship's captain and that was "pretty good for an Indian." His father, Sparrell Kennett (1856-1910) also worked on steamboats, as did W. L.'s brother Dot Kennett, who was a famous steamboat chef and chef. His other brothers probably also worked on them from time to time. Sparrell was married to Belle Furgerson/Ferguson of Pt. Pleasant and her family, her brothers Harper and others worked on steamboats. Sparrell's father William Kennett (1839-1880) of Franklin Co. Virginia also worked on riverboats and steamboats--he was married to Martha Canady of Patrick Co. Virginia Cannadays. It does not seem this branch of Kennetts is related to the Luther Kennett branch, who went to Missouri and Kentucky and started a steamboat packet line and railroad and went into government. This line goes back to the 1600s with Martyn Kynnett a shipmate. I am very interested in steamboat culture, which seemed to embody American diversity and a colorful, and sometimes sad part of American history. If anyone comes across any info concerning Kennetts/Kinnetts, Cannadys/Cannadays, Ferguson/Furgusons or Dresslers on boats. Also, interested in info about Native Americans role in riverboat culture or contact with the boats. Any referrals or help to materials would be greatly appreciated. I am new to this. Editor's note: If you want to help, contact Marji by email: alpha_mare[at]yahoo.com. We recently received this image from Robert, who would like more information. 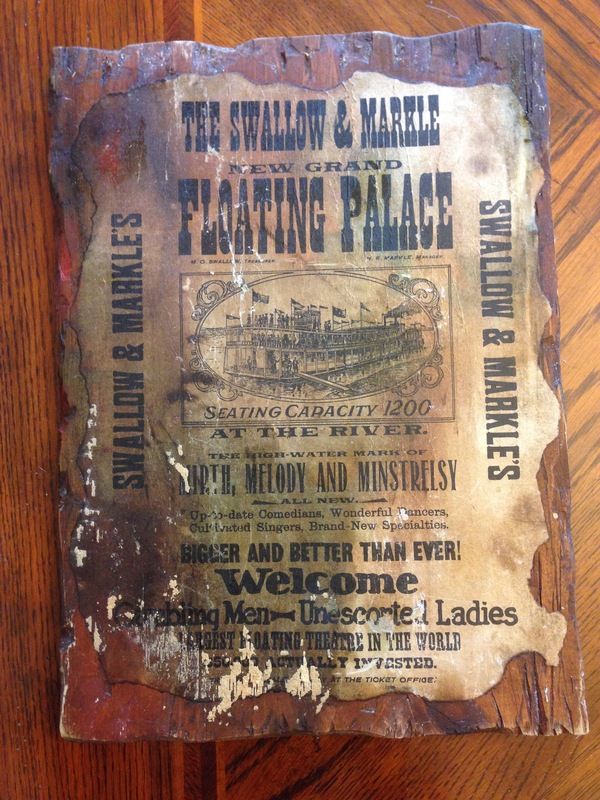 It is an advertisement a showboat, etched on a wooden plaque. Before setting off for a tour of the Gulf Coast, I will review How to Speak Southern, by Steve Mitchell (Author) and Sam C. Rawls (Illustrator). The back cover assures us, "This book is dedicated to all Yankees in the hope that it will teach them how to talk right." With How to Speak Southern in hand, I am optimistic that my travel to the Gulf Coast will be fun and educational. The book came back to mind because my taiji teacher began quoting from it in class one night. I said, "Hey! I have that book, I got it in Nashville!" Then I brought it to class later so we could all read entries and laugh. I was happy to see it is still in print. If you have not read it lately, click the title above to see your buying options through Amazon.com. 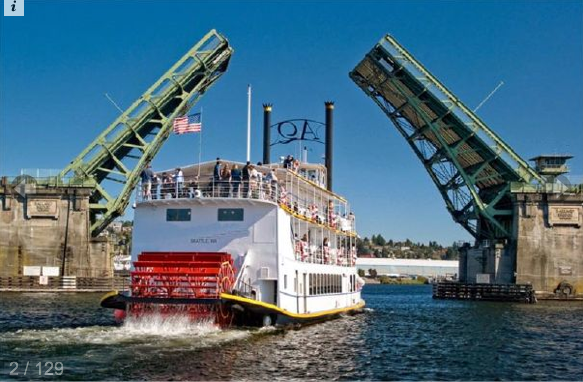 Custom built 120 Steam Powered Paddle Wheel, King County, WA Eight staterooms, real steam power, built in 1984, asking $895,000. Click here to see the ad at yachtworld.com. For about half of the new century so far, the beloved Delta Queen has been building up a list of deferred maintenance. She needs one of everything: roofs, paint, mechanical, the works. Now, with funds from the American Express, the National Trust for Historic Preservation may offer the Delta Queen a lifeline (see article - click here). Congress is also defending her, and soon she will be allowed to go back into the cruise industry. The last five years have been difficult, because the Delta Queen was left like an orphan at the waterfront in Chattanooga to make it on her own as a hotel. It all happened in the middle of a messy bankruptcy. At first the towns people welcomed her, but with difficult parking, and no public transportation, few could visit on a regular basis. Fans of the boat were heartbroken to see her in that condition, so hotel rooms sat empty. Everyone wants to go for a cruise, so her future could be bright if the right things fall into place. At this time, the Delta Queen is yet another eighty-something who finds herself having to work to survive during these lean times. However, she is anxious to go back to work. When she gets back on the river, she will be swimming in it, as they say, and have the money to address all her maintenance issues. During her final years of service, her angels and fans will have time to make a plan for her final retirement with dignity. However, given regular maintenance and improvements, the Delta Queen could cruise for another hundred years. Machines and buildings have the potential to last a lot longer than people. In dog years, an eight-seven year old machine is yet a teenager. You replace this part, you replace that part, and as long as you preserve the integrity of the structure, you have the same old ax. John Weise reports: the 2014 calendar is back from the printer & ready for shipping! The calendar features 13 more of John's photos taken from 1998 to 2008 on the Cumberland, Illinois, Ohio & Tombigbee Rivers. For more than one calendar the shipping will be $1.50 per calendar.